How do I reset my Unity configuration? I've been messing around with Unity and broke something, how do I "start over"? The following command does not work on newer distributions (as the reply is ERROR: the reset option is now deprecated). I, along with jokerdino and amithkk have created a python script that cleanly resets Unity for Quantal and above. How do I reset GNOME to the defaults? Simple. We chase each individual setting that Unity uses, and reset them to their default values, and then reload unity to apply changes. Ah yes, we also kill Unity and compiz before we start, since it is known to get tricky if we change settings under compiz's nose. Why is this better compared to using dconf-editor or dconf reset ? Didier Roche (didrocks), the author of unity python wrapper says dconf reset does not work in all cases. The consensus among Unity developers is that the settings be modified using Gsettings instead of dconf directly. What exactly is dconf ? The configuration settings were managed by gconf earlier. Gnome provides Gsettings as a replacement for gconf. Gsettings is a high level api that manipulates the settings stored in a backend. Unity stores its settings in the backend dconf since it can be loaded much faster than gconf. I would recommend running the gsettings command before unity --reset, so that you won't have to restart unity for the gsettings key reset to take effect. OK, here it is. You can use 'dconf reset' as previously outlined and will do exactly what 'unity --reset' used to do. Apparently it would actually be better to stop compiz before using the 'dconf reset'. Which I'm currently working on. This information is from a variety of sources, after much googling. Install ubuntu tweak. The beauty of ubuntu tweak is that you can save desktop and application settings and restore after you messed something up. It also has a function to go back to original settings. Sometimes people accidentally turn off the Unity plugin or setting an unsupported option in CCSM can cause it to break. I use this workaround to reset the unity configuration. 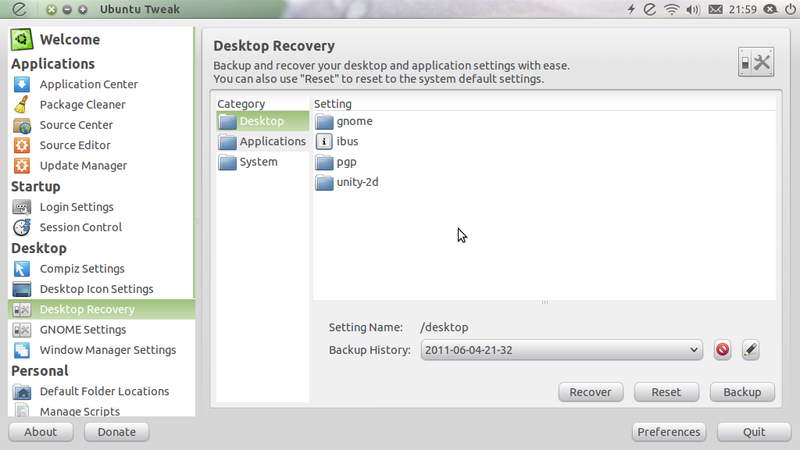 But with Unity, it resets all configurations such as the custom wallpaper, themes, icon themes etc. IMPORTANT! Be sure that you BACKUP this file, because you lose ALL Unity's settings and switch to default! helped me to completely resolve these symptoms. as shown in the log posted in the thread titled "unity has vanished" for unity run with no arguments. This not only allowed both unity_support_test-p and unity --reset to run, it also allowed Unity 2d to start. Like the author of the above-mentioned post, I have no idea what caused my problems. I am also still not sure whether the link is a complete solution, or whether I should reinstall the graphics libraries completely, but since creating the link, everything has worked fine for a few weeks now. How to reset Unity to defaults? I lost my top left panel in unity. How can I get it back? Is there a Unity alternative? How can I unbreak compiz so that unity will start? How do I reinstall Unity? How to reset Unity after being replaced by Cairo-Dock? What is managing SSH keys in Unity, and how do I reset / disable / configure it? How do I reset my unity configuration on 15.04? How to change configuration of Unity shortcut permanently?